Can I use the 64-bit version of VantagePoint? If we don't update right now, how long will you support the older versions? We strongly encourage you to use the 64-bit version of VantagePoint if your computer has a 64-bit version of Windows 7 or higher. The 64-bit version can use more RAM than the 32-bit version, which will let you analyze larger datasets faster. To learn more, please see our article: FAQ - What is my version of Windows? IMPORTANT NOTE: If you already have a 32-bit version of VantagePoint and want to upgrade to the 64-bit version, you must uninstall the earlier version before installing the 64-bit version. 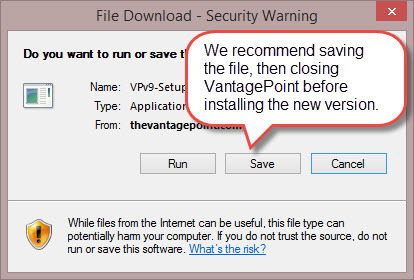 If you are unsure, we advise you to uninstall VantagePoint before installing the new 64-bit version. Reminder #1: Copy your VantagePoint Registration Code to a safe place before starting. You might need to enter it again to activate VantagePoint. To see your Registration Code, start VantagePoint, go to the Help menu, and click "Manage License". Reminder #2: There are three ways to access the VantagePoint download page. You can log in using your User Name and Password, or (more easily) in VantagePoint, go to the Help Menu and click "Visit Downloads Page ...", or click "VantagePoint downloads" in the Analyst Guide. Reminder #3: If you download in VP, we recommend clicking "Save" (not "Run"). Close VantagePoint before installing the new version. Reminder #4: Install VantagePoint using Administrator permissions. Reminder #5: The first time a user launches VantagePoint they must use the shortcut installed to the Start menu so Windows Installer can configure settings. Install the new version. Important Note: Make sure VantagePoint is not running when you begin the installation. Enter your VantagePoint Registration Code if prompted to do so. Enter your VantagePoint Registration Code to activate the license. Can VPv11 read my VPT files created with VPv10? Yes - Version 11 can open any VPT files created in v7.0 or later. If the VPT file was created in VantagePoint Version 10 or earlier, some browser sheets created by the MatrixViewer, Gantt chart, Aduna Maps, and other advanced scripts will not display correctly. You must re-create these browser sheets with the updated scripts included in your version 11 installation. Can the earlier version VPv10 (and the v10 Reader) view files created with VPv11 or later? Older versions of VantagePoint will NOT be able to read files created OR SAVED by version 11 or later. Can I have VPv11 and VPv10 installed at the same time? No. Version 11 is intended to replace version 10 and features such as toolbar buttons, functions of the scripts menu, updating import filters, macros, and thesauri, will not work correctly if both versions are installed. For this reason, concurrent installations of version 11 and any earlier version are not supported. We have stopped supporting versions 9 and 9.5, but we will provide limited support for version 10 until the next major release (several months). If you need to request a macro or filter for version 10, please remind us of the version ahead of time. There are a lot of helpful things in v11 that are not backwards compatible.